Are you planning your trip to Andalucia and you don’t want to miss out on Almeria? Then take a look at this post about what to see and do in Almeria in one day. Almeria is the capital city of the second-wealthiest Andalusian province. Characterised by out-of-this-world landscapes, archaeological traces and a lively ambience, the city and the province are must-sees of your trip to southern Spain. 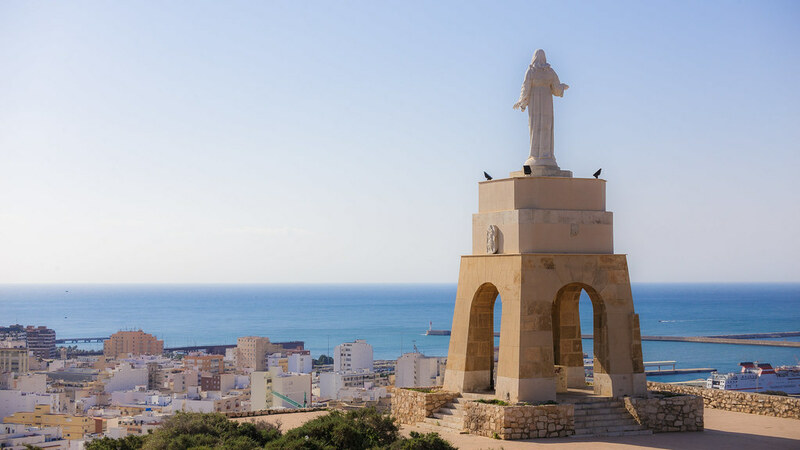 Discover the history of the city, how to get there and the most important monuments to visit and places to be so that you can say: I’ve been to Almeria! Almeria was founded in AD 955 by Caliph Abderramán III, on the remains of the ancient Roman town of Portus Magnus. During the Cordovan caliphate, Almeria was the key port of Al-Andalus and reached the maximum splendour in the 11th century, when it became one of the caliphate’s neuralgic business and culture points. In the 15th century, Almeria was conquered by the Christians and, two centuries later, there was nothing left of what once was one of the headquarters of the Moorish Spain. Earthquakes and plagues decimated its population, and it was only in the late 20th century, that it got fame and inhabitants back. First of all, you’ll need to know how you can get to Almeria. The city is connected with other European cities thanks to its airport (Spain’s 25th and Andalucia’s 4th biggest airport). Check the connections by clicking here. If you’re already in Andalucia, you can reach Almeria by train. Renfe provides 4 trains/day between Seville and Almeria (6-hour journey for €40). The same train stops in Antequera and Granada. If you’d rather go by bus, ALSA provides service from Malaga (5-hour journey. Tickets range from €9.60 and €18 depending on the hour and type of bus you choose), Seville and Granada. If, on the other hand, you are travelling by car, know that Almeria is the first Andalusian city you’ll come by if you’re coming from France (and Murcia). Take the highway A-7 from Malaga and Granada, or from the Murcian city of Cartagena to get to Almeria in just two hours. 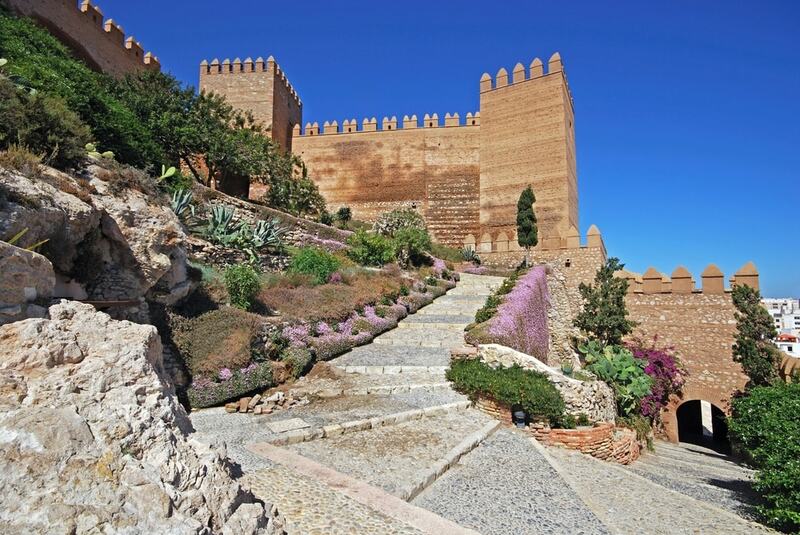 One of the most important and most visited monuments in Almeria, the magnitude of the Alcazaba is sure to leave you overwhelmed. This military fortress was built in the 10th century overlooking the bay of Almeria from the top of the Cerro de San Cristóbal. Renowned as one of the most powerful Moorish fortresses of Al-Andalus, as well as the biggest one, its magnificence is a clear reminder of the importance of Almeria during the caliphate. The highest compound, or “Tercer Recinto”, was added by the Catholic Monarchs after conquering Almeria. Tickets are free for EU citizens, whereas non-EU citizens pay €1.50. 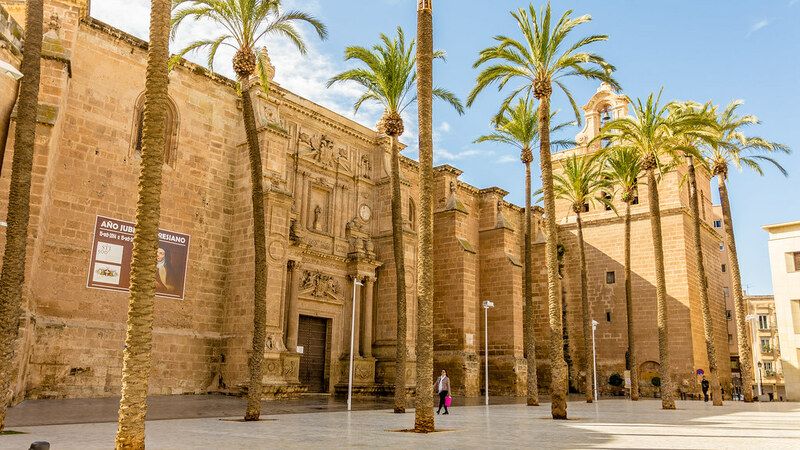 The Catedral de la Encarnación (Cathedral of Incarnation) is located in Almeria city centre, and it’s the see to the homonymous episcopal dioceses. The construction is peculiar to say the least, as it’s characterised by the harmonious mix of features of late Gothic, Baroque, Neoclassic and Renaissance in a fortress-like structure. Because of this unique combination, this Cathedral is considered one of the most important artistic and architectonic elements in whole Andalucia. For this reason, the Cathedral receives the title of Bien de Interés Cultural and Historic-Artistic Grouping in the category of National Artistic Treasure (Tesoro Artístico Nacional). Almeria’s Museo Arqueológico was founded in 1933 to store various archaeological remains proceeding from the archaeological sites in the province. Its halls welcome collections of objects (robes, pottery and esparto elements) from the Palaeolithic era until nowadays. 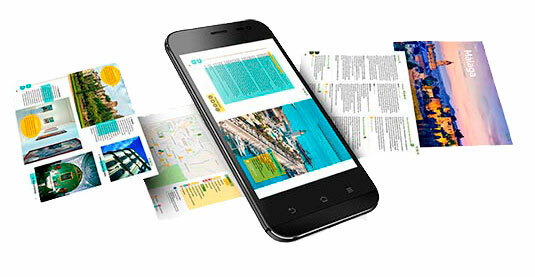 They are displayed with English and Spanish explanations, and excellent use of technology. Two unmissable areas of the museum are those related to two fundamental cultures in Almeria’s history: Los Millares (which ruled the area in the 3rd century BC) and El Argar, who lived here during the Bronze Age. The Gothic-Mudejar Church of Santiago is one of the oldest in the city, as the Catholic Monarchs had it built in 1553-1559. 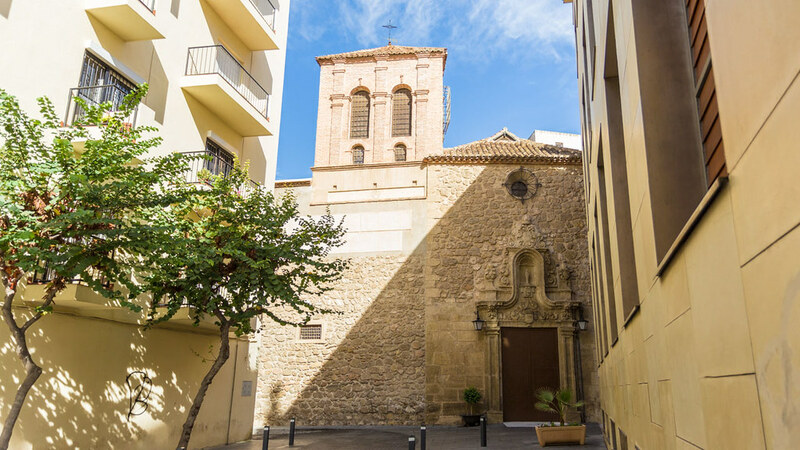 It lies in the middle of Tiendas street (one of Almeria’s busiest streets at the moment of the church’s construction) and among its features, its tower and the spectacular monumental door will draw your attention. The church is dedicated to Saint James the Moor-slayer (Santiago Matamoros), who is represented riding a horse and dressed as a soldier in a low relief above the main door. Likewise, you should visit Las Puras, a church and monastery featuring a marvellous Baroque altarpiece. But Almeria is provided with many other landmarks that go beyond the religious thematic. The three-storey Museo de la Guitarra Española “Antonio Torres”, as the name suggests, is entirely dedicated to the Spanish guitar and to whom is considered to be the Father of the Guitar, Antonio de Torres. The pioneer project “Escuela de Lutería” saw the light in 2017, on the bicentenary anniversary of de Torre’s birth, with the purpose of teaching the art of building stringed, air and percussion instruments. A peculiar example of modern architecture is the 1904 mineral loading dock Cable Inglés (the English Cable), an iron pier on the beach of Almadrabillas. El Cable Inglés is entirely made of iron and was built following Gustave Eiffel’s teachings. 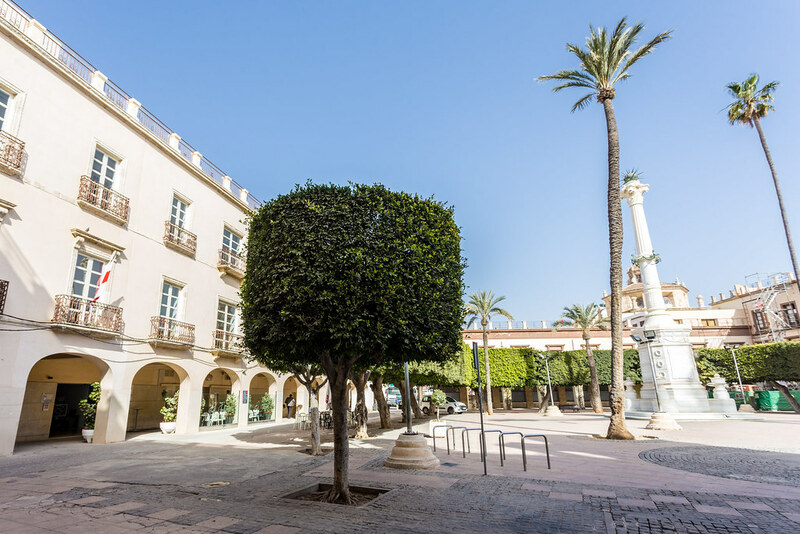 Last but not least, you should visit Plaza de la Constitución (also known as “Plaza Vieja”, the old square) where the Moorish zoco used to be. This porched enclosure welcomes the Town Hall, which stands out for its spectacular staircase and monumental, three-compound façade. In the middle of the square, you will find an 18-mt tall monument to the “Martyrs of Freedom”, as an homage to the “Coloraos”. 24 men, dressed in red jackets (to which they own its name) carried out (and failed) an attempt of rebellion against the absolutist King Ferdinand VII in 1823. You can’t say you’ve visited Almeria unless you taste the mouth-watering cuisine. The gastronomy of the city features the products typical of seafront settlements, as well as those proceeding from the nearby mountains. Sea and mountain food combine to provide you with a five-sense gastronomic experience, resulting in tasty dishes you can’t help but fall in love with. Fields all around Almeria provide green broad beans and the coloraos garlic to prepare pucheros (stewpot) and Moorish soups. Potatoes are also highly used for patatas a lo pobre (potatoes accompanied by sausage, fried eggs and ham) or with ajopollo sauce (made of saffron, bread, parsley and laurel). Swards with asparagus are also a good option. If you long for more “consistent” dishes, then you should try the choto al ajillo (a kid stew with potatoes, accompanied by a sauce made of garlic, pepper, bread and almonds), perdices con gurullos (partridge) and the hard-egg soup. And you can’t but round off with the delicious desserts that include the papaviejos (a version of the buñuelos made of potatoes), the deditos de Jesús (made of almonds, sugar, egg and honey), and the indalotes (Indalo-shaped cookies made of oranges and almonds). Honouring the Virgen del Mar, this 9-day fair is celebrated in the second half of August in the enclosure near the river Andarax. The open water swimming of the river and a boules championship are just some of the events that take place during the celebrations. During the Feria del Mediodía (Midday Fair), the lively ambience of the chiringuitos is brought into the city centre. Horse-related activities and the Feria de Alfareria Popular (Fair of the Popular Pottery) also take place during the Fair of Almeria. And just like all the main fairs in Andalucia, that of Almeria also welcomes the Night Fair, where stalls, dances and good ambience will accompany you until dawn. After your one-day trip to Almeria, you can stop by some of the most impressive landscapes of the province. 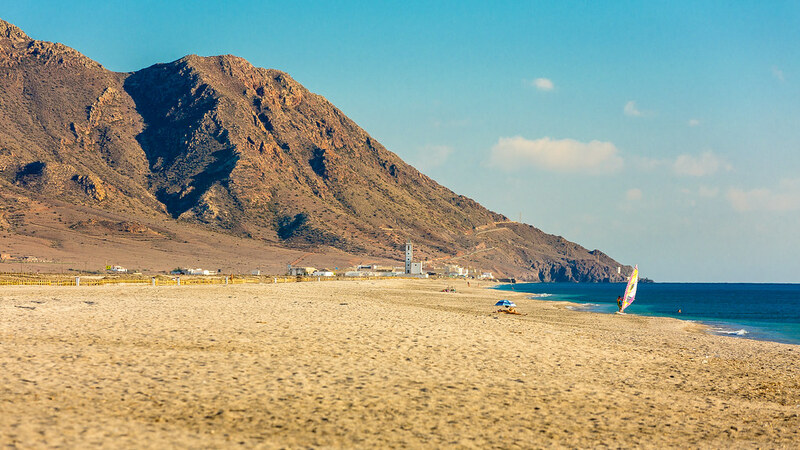 First of all, the Cabo de Gata Natural Park, provided with spectacular seashores, among the most impressive and best-preserved of the Mediterranean coast. Cabo de Gata is a natural jewel rich in flora and fauna, as well as sceneries of outstanding beauty. Click here to know more about this paradise only 30 km east of Almeria. Another natural landscape that has made Almeria famous worldwide is the desert of Tabernas. Europe’s only desert lies north of Almeria has also been the set of countless Hollywood movies and Spaghetti western. A must-see for cinephiles! On the other hand, if you’re more into the peculiar white towns of Andalucia, you won’t be disappointed in Almeria! In fact, the province welcomes Mojacar, one of the most charming white towns in the region. Its whitewashed houses envelop a magical atmosphere and legends related to the original birthplace of Walt Disney himself. If you want to know more about it and why the symbol of Mojacar is the Indalo, check this post out. And, last but not least, if you fancy a more relaxing stay in the city, check this post about the Arab Baths in Almeria. You will regain your strengths and discover the Al-Ándalus culture all thanks to a five-sense experience. Are you ready to discover Almeria in one day? Are you willing to spend some days in its province and enjoy everything you can? The holiday homes in Almeria province are the perfect spots to unwind and relax surrounded by all the comforts you can think of. A typical Andalusian-charm holiday home will seduce you and will become the optimal base to discover the hideouts of this land. What are you looking forward to visiting during your one-day trip to Almeria? Tell us in the comments and don’t forget to rate this post!